In developing the Rutting Ridge brand for the RMEF Edition Cabernet Sauvignon and Chardonnay, our design team searched for the dramatic. We not only wanted the wine to be memorable but the label as well. 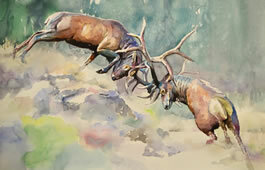 We found the dramatic in the watercolor work of renowned Texas artist, Christopher St. Leger, so we commissioned him to paint several images specifically for Rutting Ridge and RMEF. 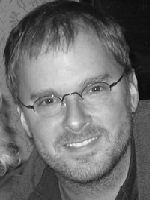 A na tive of northwest Indiana, St. Leger’s works have been shown in galleries in Austin, Houston, and New York City, and abroad in London, Frankfurt, and Budapest. 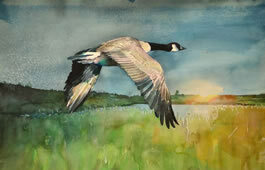 His latest works of art featuring wildlife appear on this page. The painting of two bull elk fighting, or as we named it, “Protecting the Harem,” was the perfect fit for our Cabernet and Chardonnay, and now appears on our labels. 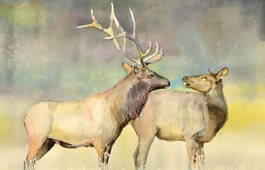 The other elk painting, named “The Courtship,” depicts a bull who obviously has designs on a cow. We’re not sure what the bull’s pickup line is, but as you can tell, he appears to be making headway. 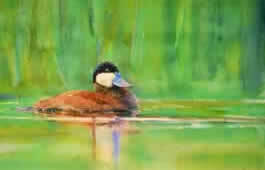 And finally, the fourth painting in this unique collection, dubbed “Home at Last,” portrays a ruddy duck swimming in a protected marsh. The skill and precision with which St. Leger executes his work in watercolor is truly admirable. Spontaneous splatters of paint accompany his choice of palette, which ranges from soft pastels to bold, dominant primary colors—all recurring themes in his works. In December of 2015, the original works of “Protecting the Harem” and “The Courtship” were auctioned off at the Rocky Mountain Elk Foundation’s (RMEF) Hunter & Outdoor Christmas Expo in Las Vegas. A limited number of reprints of all four paintings are now available to RMEF members and friends. Click here to purchase prints. And don’t forget: For every bottle sold, Rutting Ridge Cellars donates $3 to benefit the Rocky Mountain Elk Foundation’s wildlife and habitat conservation efforts. Visit our online store now!